Limited to 500 copies only!!! 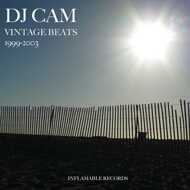 After the success of his last electronics album "Seven" (2011), Dj Cam is now back with a pure instrumental hip-hop project. 14 tracks composed, produced and mixed by Dj Cam himself and made with an Akai MPC 3000 and some vintage keyboards between 1999 and 2003. The French pioneering DJ and producer as such pays tribute to J-Dilla and all the golden-years’ beatmakers such as Dj Premier, or Pete Rock.